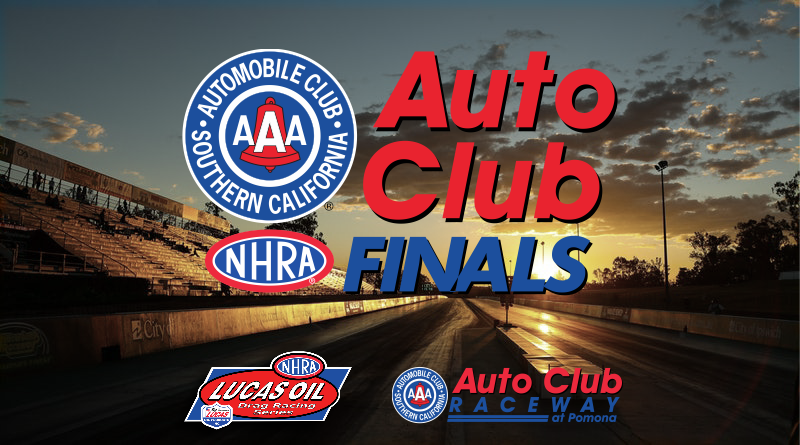 POMONA – The NHRA traveling circus rolls into the famed Pomona Fairgrounds in Pomona, Calif. this week for the Auto Club Finals, the final event in the 24 race national series. Over 300 of the top sportsman racers from around the country will be competing for monies, points, fame, and the coveted NHRA Wally trophy in five sportsman classes and four bracket racing classes. The sportsman classes in competition this week include Competition Eliminator, Super Stock, Stock Eliminator, Super Comp, and Super Gas while the top bracket racers from around the country will be competing for national championships in Super Pro, Pro, Sportsman, and Motorcycle. While most of the sportsman national champions were crowned last week at Las Vegas, the Super Comp championship is still in play along with all four of the bracket racing championships. With so many championships on the line, there should be plenty of drama and nerves at the fairgrounds this weekend. With each NHRA national event DragChamp’s sportsman preview includes an overview of each class along with the Team DragChamp Picks to win. Since the U.S. Nationals, DragChamp has picked at least one sportsman winner at every national event except the Toyota NHRA Nationals at Vegas where we shot an airball. We’ll try to get back on the board this week. Here’s the picks. The 23 car Comp field at Ponoma is loaded with talented drivers and fast hot rods. David Rampy will take his last shot this season at national event win number 100 and recently anointed 2018 World Champion Frank Aragona will try to put a bow on top of his impressive season with a win at Pomona. Tony Mandella – Tony is always a tough out at Pomona, look for him to make some noise this weekend. With the Super Stock national championship secured, Justin Lamb will look to add to his six national event win total this year with another victory this weekend. Standing in his way is a strong 62 car field of some of the best Super Stockers in the country. Dan Fletcher – Sooner or later I’m going to hit with this pick. The man has won 105 national events, I’m bound to be right soon. Jimmy DeFrank – DeFrank came super close at Vegas, look for him to finish the deal this weekend. Jody Lang – Always in the mix on the West Coast events. With the championship decided, newly crowned champ Brian McClanahan can relax and enjoy his racing weekend for the first time in months, that could spell trouble for the rest of the field. Ryan Magnus – Super talented driver in great equipment (the Lamb family Camaro) is a winning recipe. Brad Burton – Former world champ knows how to turn on win lights. Leo Glassbrenner – Leo will be looking to collect his second national event win of the season. With the Super Comp national championship hanging in the balance, Steve Williams, Don Nichols, and Mark Grame will battle it out in Pomona to determine the 2018 champion. Williams goes into the event with a 20 point lead over Nichols while Grame sits 53 points behind. Since he’s out of races to claim, Williams will need to play blocker this weekend to wrap up the championship. It should be fun to watch. Aaron Kinard – This guy has been on fire this year coming up one round shy of the Super Gas championship. With the pressure off, he should be dangerous this week. Val Torres Jr. – Super talented driver that always seems to find his way to the late rounds. Steve Williams – The guy has been on a roll for the last month, look for him to wrap up the championship and win the event. With newly crowned world champ Devin Isenhower sitting out the Finals, it’s anybody’s race this weekend since the field is loaded from top to bottom. Ken Mostowich – After making back-to-back finals at the Vegas national and LODRS events, look for Moss to run over the Super Gas field this week. Matthew Blodgett – After driving his little Vega to two national event wins this season I wouldn’t be surprised if he won again this week. He has a great combination right now. Robert Nabor – Another racer that’s had a great season. Will look to make it even better with a win this weekend. Division 1 – Shayne Beck, Narvon, Pa.
Division 2 – Jeremy Hancock, Commerce, Ga.
Division 5 – Jaron Miller, Chase, Kan.
Division 6 – Pat Osmundson, Pasco, Wash.
Division 7 – Bobby Dye, Ontario, Calif.
Wild Card – Zack Meziere, Escondido, Calif.
Division 1 – Matt Ricchezza, Cherry Hill, N.J.
Division 2 – Matt Ward, Anderson, S.C.
Division 3 – Dustin Loynes, Walled Lake, Mich.
Division 5 – Joe Marx, St. Michael, Mich.
Division 6 – Matt Kielman, Vancouver, Wash.
Division 7 – Sacha Hoefer, Calimesa, Calif.
Wild Card – Nelson Belot Jr., Dalton, Mass. Division 1 – Faith Warner, Keymor, Md. Division 2 – Earl Talley, Bowling Green, Ky.
Division 5 – Brent Erickson, Omaha, Neb. Division 6 – Devin Froud, Spanaway, Wash.
Division 7 – Garrett Hoefer, Yucaipa, Calif.
Wild Card – Tanner Asti, Henderson, Colo.
Division 1 – Don Hockway, Flanders, N.J.
Division 2 – John Markham, Bowling Green, Ky.
Division 5 – Beau Drexler, Lakewood, Colo.
And that’s a wrap for the Auto Club NHRA Nationals sportsman preview. Visit DragChamp.com daily for the latest sportsman drag race results from the NHRA Auto Club Nationals. DragChamp is your source for NHRA sportsman drag racing news and race results.